Don't wait for the top of the hour, delight your guests with one push of a button. Your guests will be truly stunned when they see your new Musical Motion Clock from Rhythm.Never has there ever been this much elegance in a table clock. The Joyful Crystal Bells is wrapped in a attractive faux wood like case and accented by gold colored elements. The eye-catching Swarovski crystals pendulum swinging gives this clock character. It plays 12 melodies with 6 of them being Hymns. 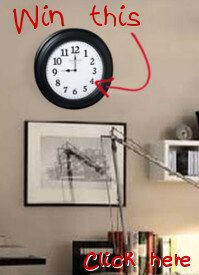 This clock also comes equipped with a night sensor and is battery quartz operated. Plays your choice of 6 Nostalgic Melodies or 6 Christmas Melodies.